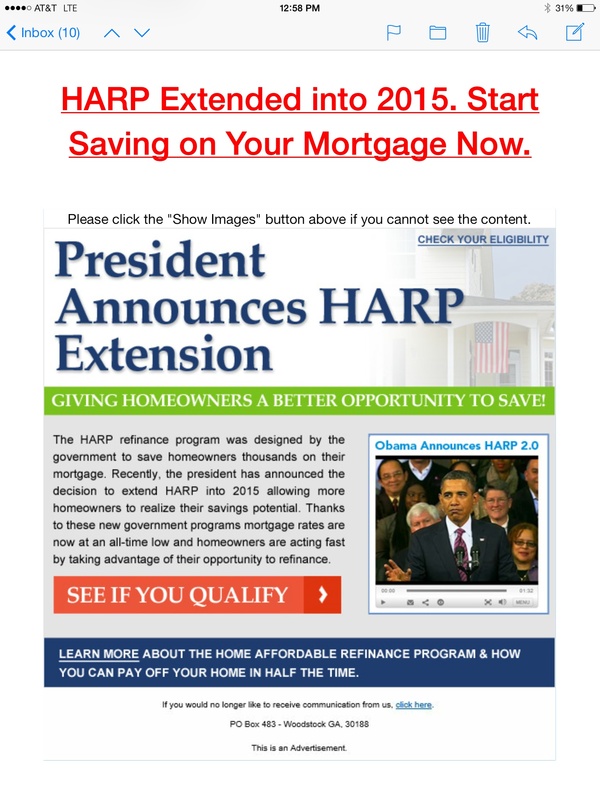 Home » Sample Mortgage Ads & Disclosures » Internet Ad for Harp – Licensed Lender? Internet Ad for Harp – Licensed Lender? So this ad came to me in an email. I never asked to receive this email and I could not tell who was the sender of the email. The Email did have a Note saying that the email was an advertisement and the email did have a link to opt out of future emails. So likely the ad did not follow the CAN SPAM email laws entirely and does not follow state laws that say that only licensed lenders or licensed mortgage brokers can advertise mortgage loan services. The ad is also a “blind ad” meaning that the ad does not identify the name of the company that is publishing the ad and offering to confirm your eligibility for the harp program. When I click on the ad I see that the company says they are not a licensed lender and they are not part of the US government. They are just a lead provider and will sell your information to other lenders and brokers. There’s several states that require internet lead aggregators to be licensed in orders to advertise mortgage services and allow consumers to submit loan inquiry forms via the internet that will be sent to Internet lenders. Internet lead providers may have questions about how to comply with all of these rules. Consulting with an attorney who specializes in this area of the law is recommended.